If you intend on tucking your caravan up for the winter rather than braving a cold-weather tour, there are a few key steps you need to take in order to ensure it’ll be in a good condition when pulled out of hibernation in the spring. The number one priority is to ensure that all water is removed from the caravan’s fresh and waste water systems, as if left in the pipes this water could freeze and expand when the temperature drops below zero, causing the pipes to burst. Set all of the taps inside the caravan to the open position and open up any exterior water taps as well, to ensure all water has run out of the caravan. Once this has been done you may also want to pour a little anti-freeze down the kitchen and bathroom plug holes, to ensure any residual water in the U-Bends does not freeze. Also empty and clean out the cassette toilet with plenty of fresh water before completely draining the system. You may then want to apply some Maintenance Spray (such as the ones made by Thetford) to the cassette seal and blade to avoid corrosion or sticking over the winter months. Another issue over winter is the build up of condensation or damp inside the caravan, which in the short term can cause mould on soft furnishings or carpets but if left untreated can cause more serious problems of damp in the caravans woodwork and body shell – something you definitely want to avoid. Make sure that all soft furnishings are removed and stored inside your home for the winter, and that seat cushions are removed and propped up in such a way that air can circulate. Cupboard doors and draws should be left slightly ajar so that fresh air can get in, and you should also completely empty and clean the fridge and freezer compartment using a little bicarbonate of soda and warm water, again propping the door open to allow air to circulate. It’s also a good idea to place a few bowls of salt around the caravan as these will absorb the moisture in the air and help to stop damp building up on windows and surfaces over the winter. Whether you are storing your caravan at home or on a storage site it is a good idea to take precautions to protect your caravan from high winds, or the worst of the elements. One way to protect your caravan at home might be to build a caravan porch. These can be built relatively cheaply and will protect your caravan from direct exposure to rain and snow over the winter months. If you don’t want to splash out on the building of a caravan porch (or if you store your caravan away from home in an outdoor storage location) then a breathable caravan cover is another good way to protect your ‘van from the elements. It’s vitally important that you opt for a breathable, waterproof cover that lets fresh air in but keeps the wind, rain and snow out. Never use a plastic cover that doesn’t allow air to pass through as this will cause a build up of condensation on the inside of the cover (and in the van), undoing all your hardwork to avoid the dreaded damp! Being stood in the same position all winter puts a lot of pressure on one area of a tyre, and can cause it to become cracked, warped or damaged. If your caravan is going to be left pretty much in one place for the duration of the winter, then you need to take some simple steps to ensure the tyres are in good working order come spring. One simple way to spread the load across the entire tyre is to move the caravan periodically over the winter months, so that a different part of the tyre is in contact with the ground when moved back into its storage location. It’s also a good idea to ensure tyres are inflated to the correct pressure, so check now and after every two months of storage. Another option are “winter wheels” which completely replace your caravans existing wheels with square metal holders. These have the added benefit of making your caravan more secure as it cannot be towed away. Please note: Providing the tourer’s normal wheels are stored securely away from the caravan then a Caravan Guard insurance customer would obviously not need to fit a wheelclamp when “Winter Wheels” are being used. If you aren’t going to be using your caravan over the winter then you’ll want to ensure that other little visitors such as mice aren’t making it their home for a few months either. Always remove all food stuffs from the caravan and clean out all the cupboards, ensuring no crumbs or dirt are left behind to attract vermin. As well as giving the inside of the caravan a thorough clean, it’s also a good idea to clean the outside of the van and apply a protective wax or polish (AutoGlym and Fenwick’s offer a wide range of products suitable for caravans) to keep out the elements over the winter. This is particularly important if you aren’t using a caravan cover as it will give water and dirt nothing to hold on to, and make that first spring clean much easier next season. It’s important when your caravan is laid up for the winter that all windows and doors are locked and any security devices are engaged in order to comply with the terms set out on your caravan insurance policy. If you have a tracking device or alarm which uses battery power to operate then you may need to keep an external power source connected to avoid these devices running flat, or at least give your caravan leisure battery a regular charge. Of course some caravan tracking devices will warn you that they are due to run out of power. If you don’t have such electronic security devices and all power is to be turned off in the caravan then it is a good idea to remove the caravan’s battery and keep it in your house on a trickle charge, to keep it in good condition over the winter. Gas bottles should be disconnected and removed to avoid accidental leakage of gas through the system over winter, which is obviously a major fire risk. These can be stored safely in the garage until needed, but just be sure to double check that any taps are turned to the closed position whilst in storage. It’s probably best checking with the dealership where you bought the caravan, or check your manual for further advice. This is a new purchase and has been very well looked after, and I would like to keep it this way, any help you may impart would be great fully received. I’ve had a look on the Elddis website for you but I can’t seem to find anything on the Cruiser. Like I say advice in this area differs depending on make and model so it’s probably best if you check your user manual or speak to your dealer. Alternatively, you could call Elddis on 0871 964 2113. Sorry I can’t be of more assistance. One other point I would make, is to place your chassis on axle stands and cover the tyres the serves to give added security, also saves the tyres from standing on ground. One point that I would mention. Is that prior to covering your van ensure you have it serviced especially for damp. Prior to going away to France in 2011 we had the van serviced as usual, on our return I cleaned the van and when dry put our cover back on. Due to constraints we have not used it for two years, I took it off recently cleaned the van (no pressure hose) and on checking inside found the bottom wall between the fridge and cooker was damp. I called our service engineer and on inspection he noticed that the outer fridge grill was showing possible mastic had degraded and that was where damp had come in. On taking the grill off it was noticed that in the top lh corner mastic was in fact missing! very possible that when being made a small portion had been missed. Consequently the centre piece of wood had become damp and a cost of £900 to renew the inside lhs completely. My advice therefore is to ensure you have the van serviced before putting the cover on and possibly have a check on your outer grills. The problem had possibly occurred in France where we had very heavy rainfall, who knows, although we did have regular servicing and damp meters applied. could have been a slow build up over the years. Thanks for getting in touch. Can I ask which make and model you have? I’ll pass your query on to the relevant manufacturer. Guidance on this area often varies so it’s probably best seeking expert advice. When caravan stored away for winter make sure to take everything including curtains seats to protects from mould. With regards to the advice as in above comments, Do not puts bowls of salt during the winter as we previously done this for years on our older caravans, this can cause the screw area to rust, yes bad rust and mould on wood. Please make sure you use the proper item which can be bought at your local caravan accessory shop, we bought the kill rock moisture traps and was able to buy a refill bucket 2.5 kg which should be sufficient to dehumidify a closed room up to 40 cubic metres for up to 6 months, can be used for kitchens bathrooms and anywhere in the house, the refill bucket cost £13.00 and the units are about £5.00 each but you can use them year after year. I jack-up the van with wheels off ground – will this avoid problems? Door opened as often as possible throughout winter – will this avoid damp? Have just used the floe system on my coachman, dead easy! 20 mins, all done. £44 quid from makers direct, web address http://www.keepfloeing.com they also make a digital thermostat about £19, although I have not yet tried this. but intend to. I have no connection with them, but have found the MD Jason very friendly and helpful. I didn’t tell Ruth that the filter is not easy to disconnect. It might need two water-pump pliers to release the Speedfit connectors and also arms that bend always. I have looked at the Filtapac and it seems that using that as a replacement would make the operation much easier next winter! A dehumidifier sounds great, but , watch out for how much they cost to run ! !, they are not cheap. I have one and it works very well but i have stopped using it due to the cost. The filter is somewhere in the between the water connection and the taps. On our Bailey it is in the cupboard beside the Fridge under the sink but it may be on the other side nearer the water inlet. I have been considering putting a dehumidifier linked to a timer within the caravan during the winter period. Has anybody got any information about this method. I don’t know what or where the water filter is. Can someone explain what I should do to disconnect it please? Have been a caravaner for several years.Just bought a new swift 565,so many new additions compared to our old ‘van, so we are very grateful for all your advice and other comments,some of which we were aware of but equally some that we wer’nt aware.Thanks and keep on puting your ideas forward people, its nice to share so we can all be at the top of our game. Regarding battery charging, we leave our battery connected year round via an electronic timer which is set to come on 24hrs per week. Enough to keep the battery in top condition, rather than having to remember to plug. I keep my caravan at a friends house so I have a small solar panel in my front window which is connected to the battery to trickle charge it during the winter months. If you take the battery out remember not to store it on a cold concrete floor as this could damage it. Thetford had a lot of problems last year with split toilet tanks , even if drained there was still some water left. They have a free upgrade drain pipe for some models , contact thetford and they will send you one free. With regards to your two questions, we know that leaving a caravan plugged into the mains isn’t possible for some people, and perhaps more importantly that leaving a free standing electric heater on for so long could be a potential fire hazard, even if left on frost setting. However David’s advice above on using a greenhouse heater seems worth bearing in mind, as these devices are specifically designed to be left on permanently and have a very low heat output. That said, if you don’t have any electronic security that relies on it then probably best to just take the leisure battery, or if you do, then just plug your mains lead in overnight now and again to keep the battery topped up. Or you could just follow the tips above to avoid dampness or freezing, rather than relying on an electric heater. The “Floe” systems do a similar thing but using an electronic air pump, and will ensure that every last drop of water is flushed out. One point not mentioned, to get all the water out of the van, close all taps, take the head off the shower and blow down the shower pipe, I got another litre of water out using this method, don’t forget to open tapes again afterwards, I also remove the filter as these can hold water, keep the filter to put in when you sterilise the pipes next spring, then replace it with a new one. Good article. Really helpful advice for us who are facing the first winter with our caravan. We had thought of most of it, but some really useful things we hadn’t. Just two questions – we have been advised to keep the mains lead plugged in all, the time to keep the battery charged. Do you agree with that? Secondly, a magazine article (sorry, no idea where or when) suggested putting a small electric heater on frost setting in the van, on the basis that the electicity it used would be far less than reparing any damage caused by ice or damp. What do you think? I used a breathable cover for the first time last winter and was all good. The cover needed a few patches where it rubbed on projections ~ used the bag for patches ~ but the van was clean & tidy this spring. Good helpful article on ‘winterizing’ the caravan – some things I hadn’t thought of. Glad you’re finding the advice useful guys. With regards to caravan covers, we think they’re a great idea providing you go for a high quality breathable one. In fact, the caravan covered in snow in the photo belongs to a friend of Caravan Guard, and they have now purchased a breathable cover after the amount of snow we had last winter! It’s also a good idea to go for a cover which is specifically designed for your caravan as it will not only fit perfectly, but should also have a door zip, meaning you can still check inside the caravan sporadically through the winter. 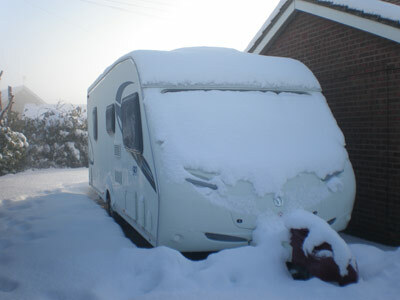 We have as first time caravaners adhered to the letter for winterising our caravan. We was wondering if to buy a caravan cover but some say no and some say yes what would you do ? Great advice to us newbies thanks. Good easy to understand advice. Thank you. Thanks for the advice, we packed our caravan away at the end of October, there was a copy of things we didn’t do but most of the important ones we can happily say done. Thanks for the good advice. I would have thought that it was not a good idea to have a battery on charge in the house as a battery gives off a highly explosive gas when being charged it is recommended that when charging a battery it should be done in a well ventilated area.